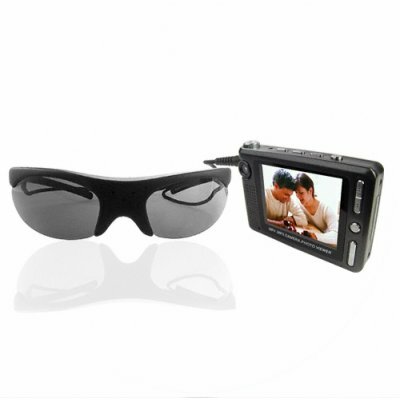 Successfully Added Sunglasses Camera With Video Recorder to your Shopping Cart. The World's Smallest Color Pinhole Camera built-in this fashionable sunglasses for hidden Video Recording. How does it work? With no external power needed, you simply put on the sunglasses and then connect the directly to the included portable DVR to instantly start making hidden recordings wherever you are. Originally designed for law enforcement agencies for their hidden investigations, this powerful digital video camera and recorder is now available to everyone else who needs to conduct covert or operations. As a bonus, the included DVR style portable recorder can also act as a stand alone 2 MP photo and video camera and includes an advanced swivel lens so you can take all angle photos. This is a great product for serious work or just for fun and comes to you with a low factory direct price. If you have some upcoming investigation work to do, order yours now so you will be ready to catch that perpetrator in the act (without them ever knowing)! This product uses the PAL color system. If you need an NTSC version please contact our customer service team.